I’ve always respected the idea that Native Americans who hunted bison would put every inch of it to good use. Meat, bones, hide, everything. 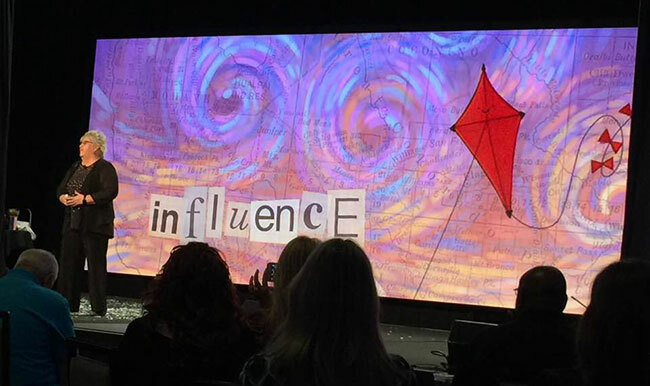 As a speaker who just so happens to be an artist (or is that an artist who happens to be a speaker? ), I love it when someone makes the most of everything we have to offer. Oftentimes, my art gets used in the printed program and marketing materials that promote the event. Other clients give products featuring my art as thank you gifts to sponsors and volunteers. Sometimes it’s even incorporated into the stage design! A recent client went next level and it was awesome. 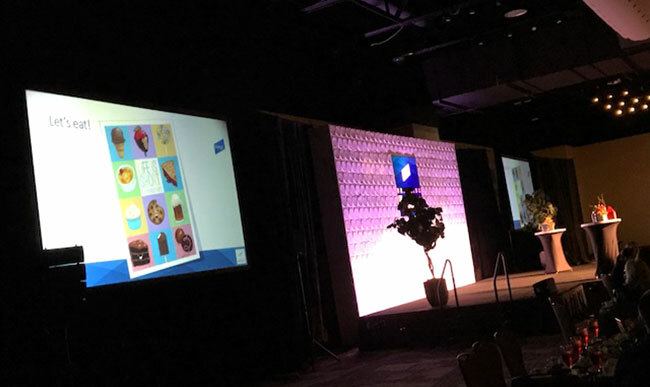 Not only was I able to deliver their luncheon keynote, but they used my art in a multitude of ways that tied my message into their event brilliantly. It’s not surprising that Baird was listed in Fortune’s 100 Best Companies to Work For, as they put a lot of effort into the small details to create a wonderful experience for their people. 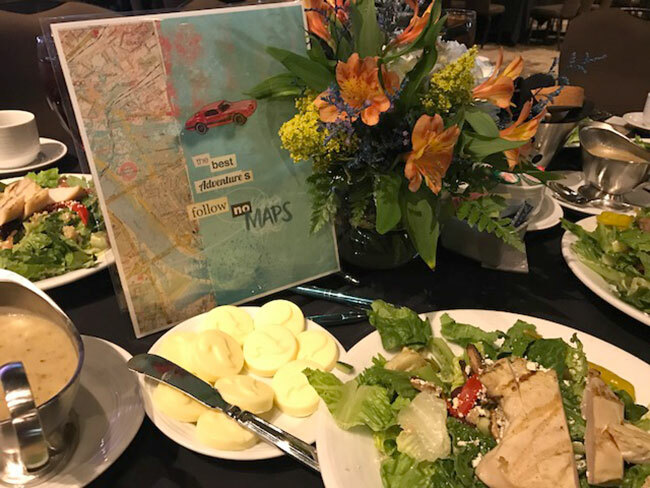 For example, Kristin, the meeting planner, coordinated with the catering team to place the yummy dessert prominently at each spot, which we complimented with fun cards we provided to encourage attendees to make it their first course. 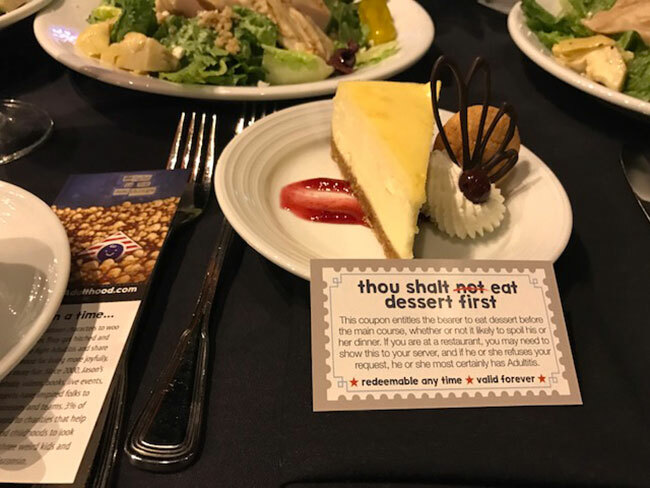 During my program, when I asked who had eaten dessert first and only about 5% raised their hands, it perfectly underscored my point about how enslaved we are by Adultitis and it’s insidious rules that don’t exist. By identifying and breaking these so-called rules, we can take great strides in becoming more innovative and fulfilled at work and home. It was a cool way to bring everything full circle. 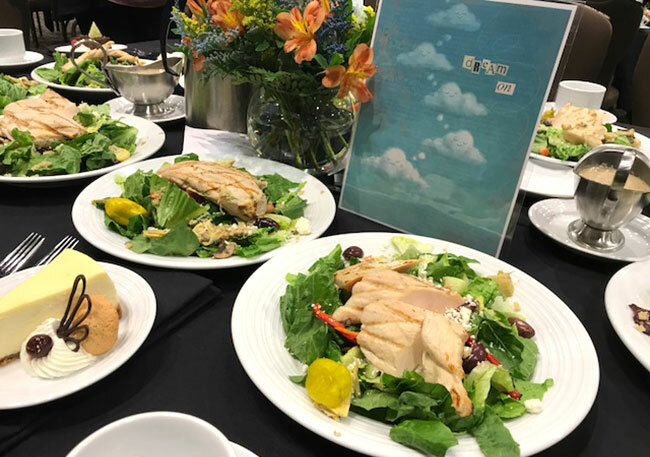 Meanwhile, art that was specifically chosen to complement the theme was utilized to help brand the event via signage in the registration area and on the agenda boards throughout the space. Prints that reiterated points from my talk were included in the centerpieces at each table, and given away as fun door prizes at the end. And at the conclusion of the program, I had a mini art show, where people could take home reminders of what most resonated with them. I love being able to chat with people afterwards, signing and personalizing their keepsakes. 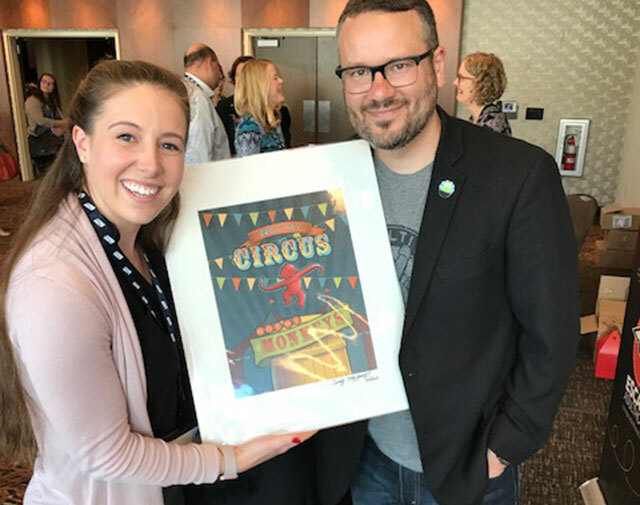 It’s incredibly gratifying to know that when someone buys a piece of art to hang on their wall, my message lives on beyond the sixty minutes I stood on stage. 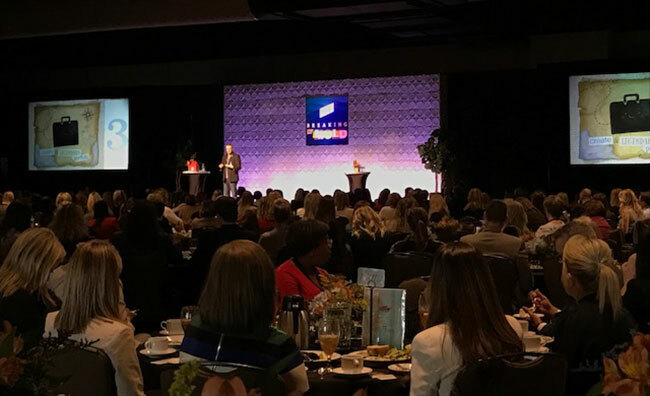 Kim and I love teaming up with creative, smart organizations and meeting planners who are eager to create a truly memorable multi-dimensional experience for their people! I love your promo/planner event you have unfolded here…a couple of months ago a new lass in the fiber-crafts selling world asked for ideas to sell her product at a show – I basically said “don’t do clutter” – provide a mirror for the buyer to really see what it looks like (she was selling shawl pins)… and maybe a plain coloured shawl to see the effect.